The Blogger app on my new phone is a little glitchy, and my post... gone. One of the things I'm missing most since going "gluten lite" are those instant ramen packs. Yeah, yeah, yeah I've heard how bad they are for you. But man, oh man... they cooked up quick and hit the spot. And of course before deciding to lay off the gluten I bought a bunch of ramen. Well thankfully I have a cousin living nearby and I'm sure she will appreciate the donation. I was shopping in Honest Weight a few days ago when I spotted a new item. 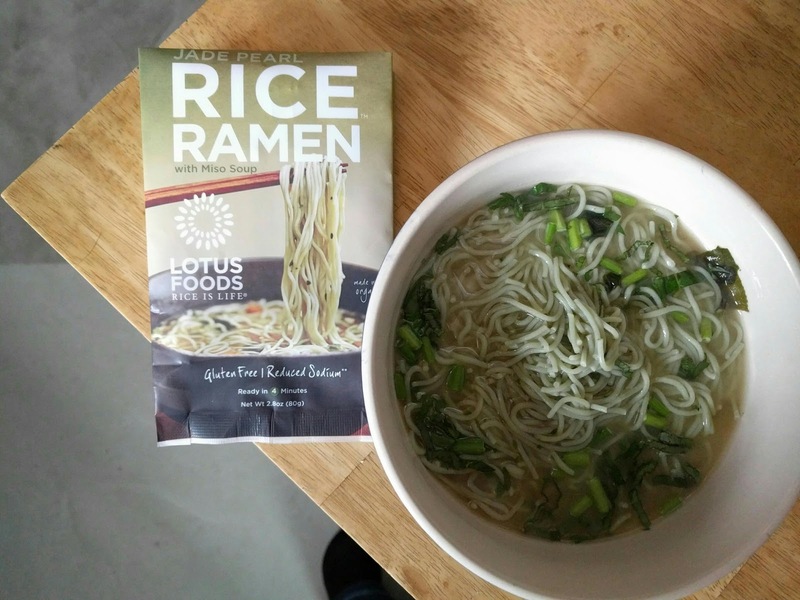 Gluten free ramen from Lotus Foods. They had three varieties to choose from - Forbidden Rice, Millet & Brown Rice, and Jade Pearl. The Jade Pearl noodles that I cooked up are as the package states "infused with chlorophyll-rich wild-crafted bamboo extract," and has a "delicious light vanilla taste." Hmm. Anticipating the miso soup would be on the bland side, I cut back on the water hoping for more flavor. Nope. Pretty bland. A dash of soy made it better but you're better off just buying the noodles separately and using your own better broth. The noodles were okay. Didn't catch that vanilla taste, but they cooked up fine and didn't clump (which I've found happens to rice noodles from time to time). I may tinker around with them and try using it for pancit or palabok.